Participation by GSDs in flyball is growing. Flyball is a team dog sport and participation by GSDs in flyball is growing. Each dog team consists of a minimum of four dogs racing in each heat (plus up to two alternate dogs). Alternate team members can be interchanged after each heat is completed. There are between 3 to 5 heats per race, and a team has to win a majority of heats to win the race. How does the dog sport of flyball work? Flyball is actually a timed relay race between two teams of 4 dogs. These dog teams race side by side at the same time down a 51-foot (15.54m) course. 1) go over 4 hurdles to the end of the flyball course, 2) trigger a flyball box pedal, 3) catch (retrieve) a tennis ball and then, 4) return back to the start/finish line over all four hurdles (with the tennis ball in it's mouth) to where the next dog eagerly waits to start it's own leg of the heat. The first flyball team to have all four dogs complete the course, without error, wins the heat. Missed hurdles and dropped balls require the dog to rerun the course after the rest of the team has finished which adds extra time to the overall heat for that particular team. Needless to say, each team wants the fastest and cleanest run possible from each of the dog participants involved and German Shepherds can certainly add extra speed to the team. Jump heights for each team are set at 4 inches (10.2cm) lower than the shoulder height of the smallest dog member in each team. 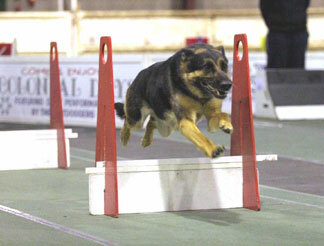 The minimum height of the hurdles in a flyball course are 8 inches (20.3cm) and the maximum height 16 inches tall (40.6cm). In the early days of flyball, there were no start lights and no passing lights of any kind. Today that has changed. Electronic Judging System (EJS) are now commonly used at flyball competitions. Similar to the lights you'll see in drag racing, these lights and infrared timing sensors make it possible for competitors to track their starts, passes, finishes, and individual dogs' times down to the thousandth of a second. It is not uncommon for teams to run all 4 dogs through the entire course in less than 20 seconds. The NAFA (North American Flyball Association) World Record is now under 16.0 seconds.